John Rain is back. And “the most charismatic assassin since James Bond” (San Francisco Chronicle) is up against his most formidable enemy yet: the nexus of political, military, media, and corporate factions known only as the Oligarchy. When legendary black ops veteran Colonel Scott “Hort” Horton tracks Rain down in Tokyo, Rain can't resist the offer: a multi-million dollar payday for the “natural causes” demise of three ultra-high-profile targets who are dangerously close to launching a coup in America. But the opposition on this job is going to be too much for even Rain to pull it off alone. He'll need a detachment of other deniable irregulars: his partner, the former Marine sniper, Dox. Ben Treven, a covert operator with ambivalent motives and conflicted loyalties. And Larison, a man with a hair trigger and a secret he'll kill to protect. From the shadowy backstreets of Tokyo and Vienna, to the deceptive glitz and glamour of Los Angeles and Las Vegas, and finally to a Washington, D.C. in a permanent state of war, these four lone wolf killers will have to survive presidential hit teams, secret CIA prisons, and a national security state as obsessed with guarding its own secrets as it is with invading the privacy of the populace. But first, they'll have to survive each other. 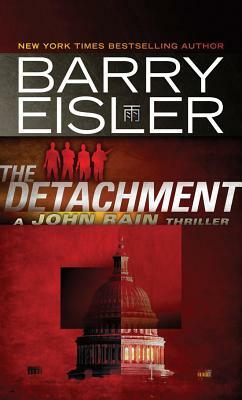 The Detachment is what fans of Eisler, “one of the most talented and literary writers in the thriller genre” (Chicago Sun-Times), have been waiting for: the worlds of the award-winning Rain series, and of the bestselling Fault Line and Inside Out, colliding in one explosive thriller as real as today's headlines and as frightening as tomorrow's.